Paralleling the festival’s own annual tradition the suits at CorridorStyle therefore dedicated the 44th edition to Shaun and presented him with the “El Maquina Del Temps” award for making it this far. Even though it had no official 40th anniversary we hoped the organisers would be showing midnight screenings of Edgar Wright’s SHAUN OF THE DEAD to help us celebrate. Alas, no joy. Often struggling to keep up with the festival’s “normal” intake of alcohol we knew that the extra quota brought about by Shaun’s celebrations would require the assistance of a couple of pros. Step forward CorridorStyle new recruits Jim and Cal, merging into the Sitges slipstream with ease. And so it was that two became four. We decided to kick it old skool for this special edition of Sitges and chose to stay at the Hotel Galeon. She’d never let us down in the past and we knew that the magic breakfast buffet Tater-tot action was going to be a required morning ritual. The festival program therefore fell into two natural halves. An idea of how the first half (Shaun’s celebrations) panned out can be gleaned from the 2011 festival photos. For any additional commentary you’d have to ask Juan at The Road Cafe as we’ve little to no recollection. The foreshortened second half of the festival (9th – 13th) was where we’d have to make up for lost time and get stuck into the film program proper. This year organisers tipped their hat towards Steven Spielberg’s A.I – ARTIFICIAL INTELLIGENCE which was celebrating it’s 10th anniversary. We’d rather be eaten by a cloned shark than sit through that toss-pot of a film again but perhaps the organisers were instead once more celebrating their favourite son, Stanley Kubrick, who’s script it was that eventually landed in Spielberg’s lap. While we do lend an ear to whatever theme the organisers are suggesting we also generally flip them the bird and go with what we know. K-O-R-E-A!! We were buzzing at the prospect of reacquainting ourselves with two former favourites. His 2008 smash THE CHASER was going to be a tough act to follow but Na Hong-Jin looked like he’d thrown the kitchen sink at his sophomore effort THE YELLOW SEA. And we go all teary eyed when we hear mention of ARAHAN (2004) so the return of its director Ryoo Seung-Wan, and leading man Ryu Seung-beom with THE UNJUST was a no-brainer. Rounding off the Korean trinity, and purely for its title and mustachioed star we pitched in INVASION OF ALIEN BIKINI. Throw in a few documentaries (CORMAN’S WORLD, RESURECT DEAD, and TRANSCENDENT MAN), moody French dystopian effort CARRE BLANC and one for the festival organisers’ theme (ANOTHER EARTH) and I’d say we had a pretty good go at fitting in the full festival cross-section in just 5 days. For our detailed daily dirt you should check out our Blog but the general consensus was that this year was another classic hit-and-miss Sitges. The Koreans continued to deliver and with THE YELLOW SEA Na Hong-Jin proved that he’s no one-hit-wonder, although he was just pipped for CorridorStyle’s 2012 Kimchi honours by THE UNJUST. Although he appears to be going out of his way to let everyone know what a prick he is Von Trier’s MELANCHOLIA was impressive, but scooping this year’s CorridorStyle Golden Claw Hammer award was BELLFLOWER. Although a lush looker it also had character and since the days of Shane Carruth and PRIMER we’re always ready to bow down to a multi faceted talent such as Evan Glodell. For the record, the organisers didn’t agree with us and went instead with Kevin Smith’s RED STATE for best motion picture – but what the hell do they know! Even in these hard times the festival managed to bump up the numbers on the previous year with a total of 115,000 bums on theatre seats (5000 up on 2010) & 150,000 visitors in total (up 10,000). A total of 63,000 tickets were sold (which even by my 1st grade math suggests that half the audience skanked in on a freebie) and 600 accredited journalists of 430 different media outlets from 20 countries. Nice work Angel! 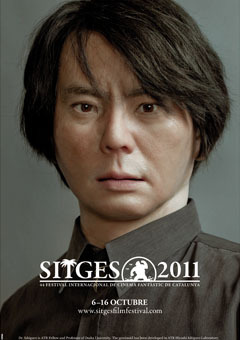 And as is the case every year, regardless of the quality of films that make our short list, the town of Sitges itself is the big winner and the number one reason we’ll be back in 2012.